In 2011, ClassPass founder Payal Kadakia had just joined startup accelerator Techstars. Within months, she’d been on the cover of Inc. Magazine and featured in Mashable, Business Insider, Gigaom and most every tech and business blog. She should’ve been living the startup dream. The only trouble was, no one was using her product. Spoiler alert: ClassPass has certainly found its footing and is off to the races. But it took years of pivots (three major product iterations), rebrands (from the original Classtivity to the now-famous ClassPass), and good old-fashioned conviction to make it through. Now, Kadakia advises founders to constantly return to on one all-important question: what problem in the world are you trying to solve? With her eye steadily on the mission, and a laser focus on only the most critical metrics, she guided her company from a near-bust to a $470 million game-changer. In this exclusive interview, she walks through that trajectory, sharing the nine key lessons she’s learned on how startups building a marketplace can find product/market fit. 1. Shorthands help get you known, not grown. 2. Gauge if you’re powered by steam or wind. 3. At the start, do as much as you can manually. 4. Honor the transaction above all — and let it break you. In its second iteration, armed with a bare-bones website, the company had taken a huge leap toward product/market fit. The Passport launched in December 2012 and was a quick hit. Reservations were finally coming in — 20,000 in the first 6 months alone. Early on, don’t worry about branding or your company name. We changed both many times. With marketplaces, it comes down to changing human behavior. What matters to me is getting someone to class. A lot of founders try to predict every behavior their users might demonstrate, installing guardrails to guide every interaction with the product. But if you do that too early in your product’s evolution, you might actually miss out on observations that would put you on the fast track to product/market fit. In fact, it was a common customer “cheat” that gave ClassPass its last major push toward the product it has made its name on. By this point, the Passport had taken off like gangbusters. But it was intended to be a one-time opportunity to sample classes. From there, the assumption was that users would find a favorite studio and join it. The answer? A subscription offering. It was the final evolution into the ClassPass product that users know today. It launched in June 2013 as Classtivity ClassPass. Let your users "play" in your product. Don’t overprescribe or force a path. Build a sandbox, not a maze. That’s when you’ll spot the behavior that orients your product. By late 2013 — nearly three years in — Kadakia and her team had really found their footing. They understood how to get their customer to class and had built the product that customers wanted. The evolution would be formalized in early 2014 with an official name change from Classtivity to ClassPass. In the moment, it’s difficult to see why this is necessary. “You always think you're bigger than you are. When we first changed our name and shifted the product from Classtivity, we had done 20,000 reservations. It felt like a lot at the time. But now, we're closer to 50 million reservations made,” says Kadakia. “Who remembers Classtivity, or even this idea of a Passport now? In the halls of ClassPass, this idea of Passport reservations is a data field my engineers see every once in a while and ask, ‘What was this?’"
7. Find — and flaunt — your metric to rule them all. 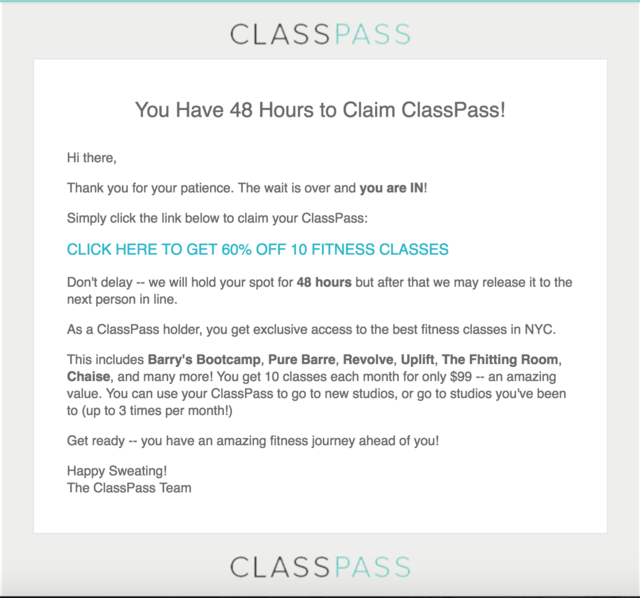 For ClassPass, that reservation number touched every key indicator for the business. It offered insight into churn, revenue and engagement. It represented how happy studios were with their experience. And most importantly, it became a quick snapshot of the impact the company was having. 8. Abide by Fogg’s equation for user behavior. ClassPass’ subscription offering was the key. It unlocked the growth that has made the company a $470 million company — and fulfilled Kadakia’s dream of getting people into the studio. But she is quick to note that she wasn’t, and isn’t, done. Customers’ needs change, markets evolve, and product/market fit is dynamic. According to Kadakia, all of the following movements toward product/market fit should continuously bring you back to one question: what problem in the world are you trying to solve? In search of the “fit” part of product/market fit, founders can veer away from their first principles around the problem they want to solve. To avoid that, don’t mistake external indicators — like press mentions, financings or social media followers — for product/market fit. Early on, do part of your product manually in order to fully understand the customer experience while it’s still easy to improve. Focus your efforts on completing transactions and don’t worry if volume breaks what you’ve built. If users love your offering, they’ll be willing to wait for the site to work. Don’t overprescribe user actions. Instead let them explore your product: you may be surprised by how they intend to use it. If you want to influence user behavior, use Fogg’s equation. Be willing to kill your darlings and know you’ll always be iterating to maintain product/market fit.